Day Temperatures in North India now in the Below Normal Region !! In H.P, strong winds and hails in some pockets caused damage to apple and fruit crops in Shimla, Kullu, Solan and parts of Mandi districts. 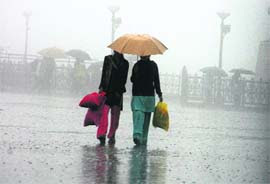 The maximum precipitation of 50 mm was recorded at Pachhad in Sirmour and Kasauli in Solan district. Una had 42 mm, Narkanda 28 mm, Kufri 22 mm and Dharamsala 20 mm. Dhauladhar ranges experienced heavy snowfall,dropping the temperature considerably. The nights in the state were in the range of 3-5c in the upper regions. The lowest night temperature in Kashmir was -6c at Drass. Reports of rain, in H.P. were received from Jawalamukhi, Palampur, Ranital, Dharamsala and McLeodganj. Overall too, the days temperatures have come down to "reasonable " levels. The high intense heat pocket is now restricted to a patch in the central areas of India ( highest in India was in this region, Brahmpuri at 44c).. Otherwise, we see a large portion along the West side is in the near normal range, and the Northern belt , now in the below normal range. (IMD departure/Day map). Due to this "cooling Off", we see the seasonal low weakening a bit. The central core region of the low was 1004 mb today morning.